As a creative design studio, it’s so refreshing to see more and more companies invest in their workspaces. Recent studies have proven that the right working environment will improve productivity and retain existing employees whilst going some way to attract new ones. “97% of workers consider their workplace a symbol of whether or not they are valued by their employer”. Gone are the days of working in isolated cubicles or stark clinical white spaces. Companies have realised that when the office evokes the ethos of the business, morale, productivity, communication and energy is much increased amongst employees. Here at Soulful Creative, client requests vary wildly but there are some key features and benefits that seem to be a common trend regardless of the workspace, office location, size or industry. The reception area is the introduction to the company. It gives a sneak preview of what to expect in the main office area but also what to expect from the company itself- so make the first impression count! 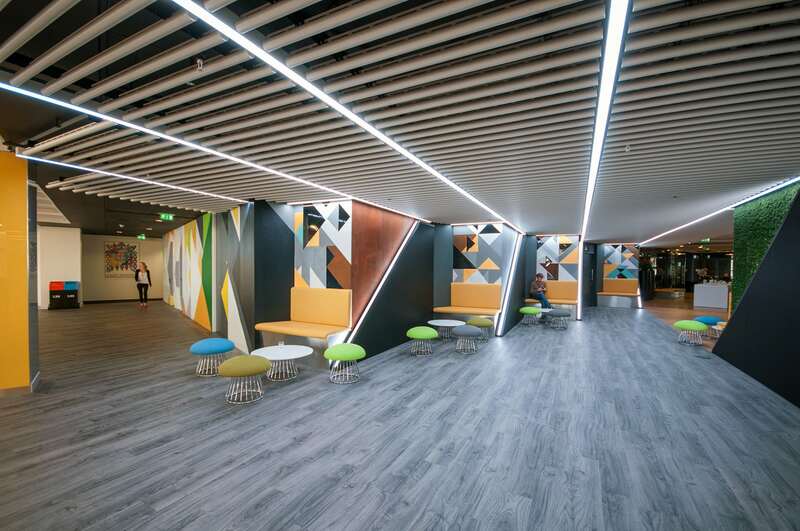 Level39 is a world leading tech hub community; below is an image of their reception area we created in collaboration with an office fit out company. It’s comprised of a combination of graphics, textures, angles and light to create a dynamic reception area that has a multitude of uses for staff and visitors alike, complimenting and enhancing their brand. A workspace that clearly defines the company values and identity is key. It makes employees feel part of something special. It helps them invest in the purpose of the company and makes them feel their contribution and efforts are valued. A design incorporating a company’s brand and values can help communicate their message throughout the office environment. We’re frequently asked to help companies create a look and feel that evokes the company’s ethos. Being able to do this in a clever and creative way is key to achieving the best results for the client’s needs. 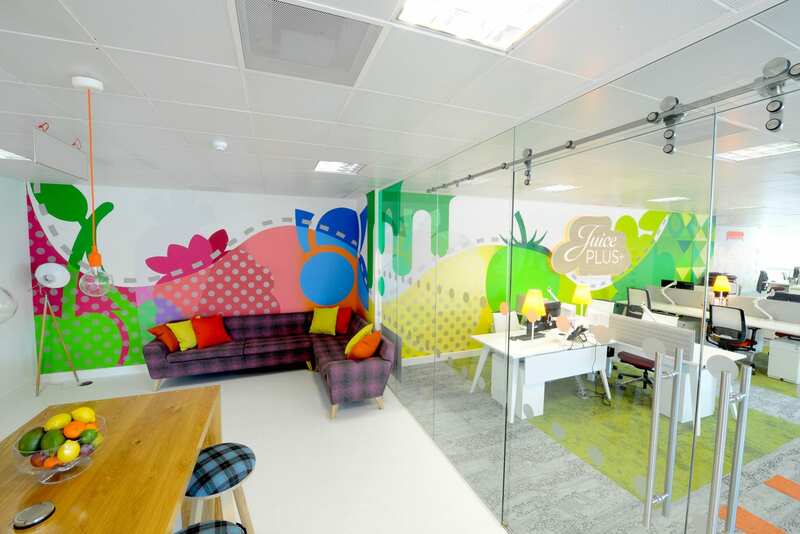 “Soulful Creative created a vibrant and playful design for our two office spaces. 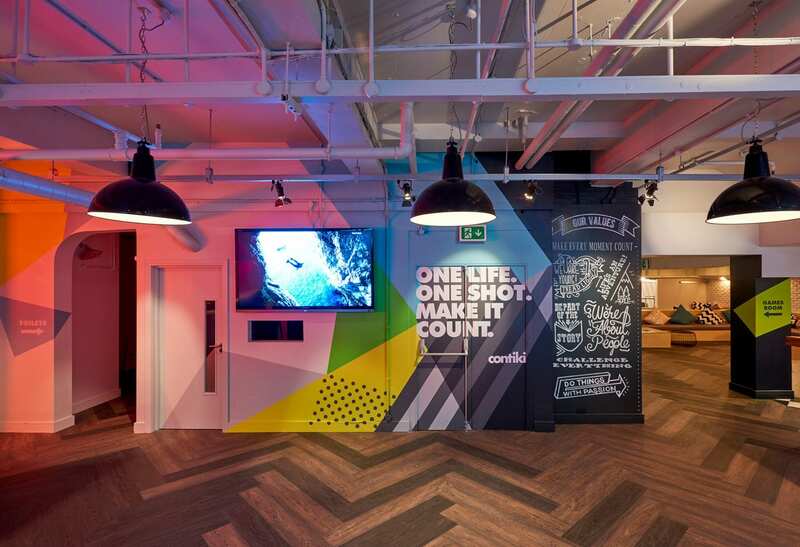 They designed inspiring feature walls incorporating our brand values bringing them to life”. Whether it’s a refresh or a complete transformation makeover, updating the key areas in an office can do wonders for your team’s morale. Fresh office decor be it graphics, murals or bespoke art pieces, leads to team members having pride in where they work. It makes employees feel that they’re valued and appreciated. Office decoration is cost effective alternative to an expensive office move and can add the ‘wow factor’ to an existing space. 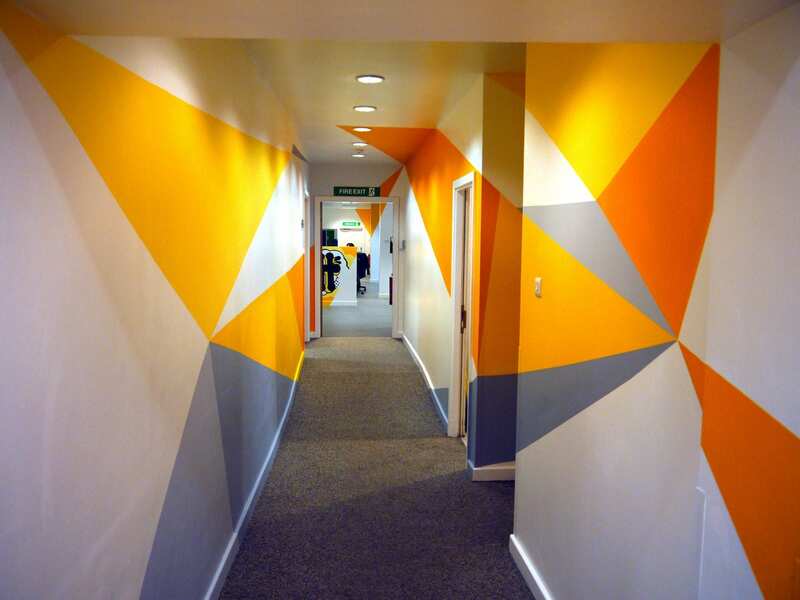 “Soulful created an amazing one-off piece of art for our offices and it completely changed the ambience of the room making us all feel creative and inspired”. We spend a third of our lives at work so it’s important that the offices- especially open planned ones, have clear zones or functions. 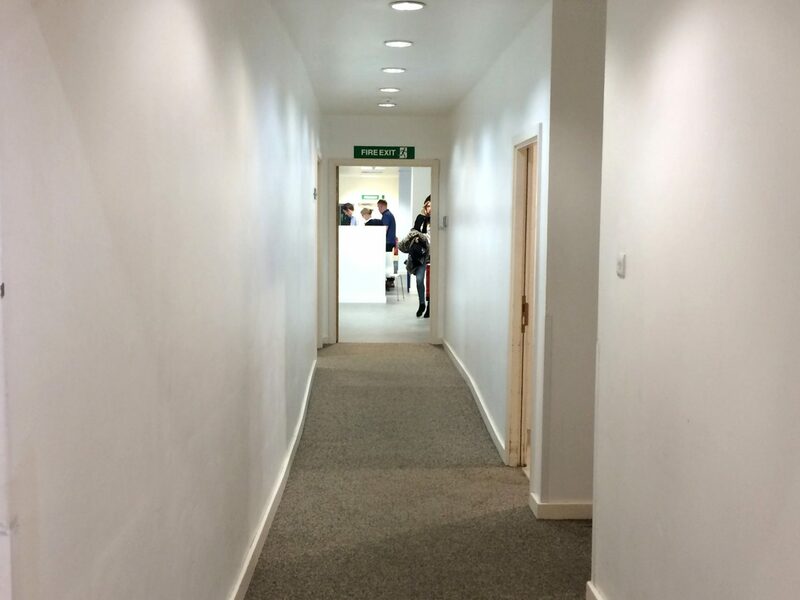 Whilst it’s great to have a working area where people work together its also important to ensure a level of flexibility where employees can work alone or in a smaller group for a period of time, have formal or informal meetings, conduct conference calls and take time to chill out or eat away from their desks. Using a colour palette that is cohesive to the company brand is a clever way to divide an open space into different zones. This can be further enhanced with the addition of illustrations or type based graphics to give personality or character to these areas. “Well-design workplaces can communicate a company’s strategy, brand and culture, while encouraging the behaviours leaders want to see in their organization – all fostering higher engagement levels”. By carefully considering these 4 key elements of the workspace within your company you can alter how employees feel about coming to work. Transforming your workspace can be a morale-boosting boosting way to improve your business environment and can have productivity benefits too. Our clients often want a complete transformation of their space and they can really see the benefit from our expertise. With the result being so much more than just a mural. If you’d like to have some Soulful magic injected into your workspace, feel free to contact us for a free consultation.